Kantic Brightening Moisture Mask - Cult product. Best-selling. Immediate glow. Award-winning. Celebrity favorite. The original mask. Ideal for sensitive or sensitized skin, this soothing mask is packed with natural botanicals to protect and brighten dull skin. Oats, known for their softening properties, are combined with wild pansies to speed the recovery of distressed skin and calm irritation. Antioxidants from grape extracts protect the skin from environmental stress, while the powerful blueberry reduces facial redness. Formulated in Switzerland. Ideal for sensitive or sensitized skin, including after cosmetic treatments. Reduces redness and is recommended for rosacea prone skin. Once to twice weekly, apply generously to cleansed face and neck. Rinse thoroughly with lukewarm water after 15-20 minutes. This moisturizing mask will not harden. 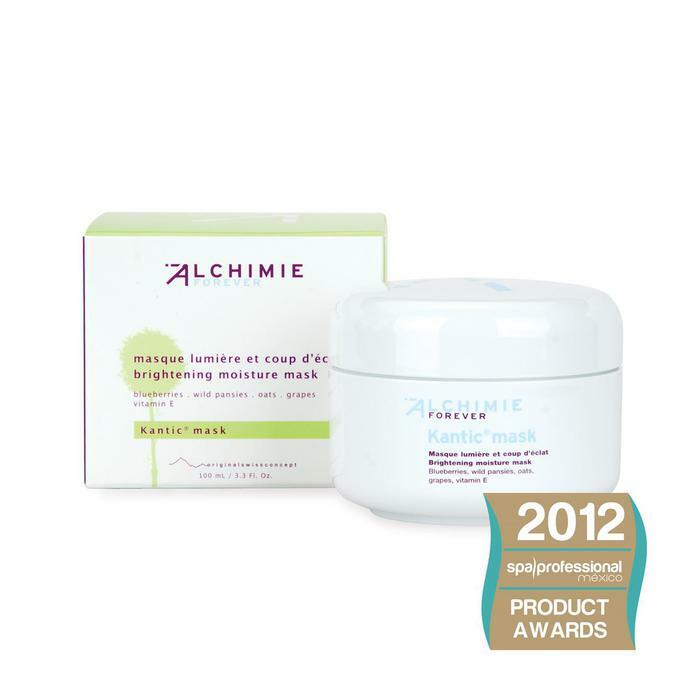 Follow with your favorite Alchimie Forever cream for optimal results. Suitable for all skin types, in particular dry skin. Ideal for sensitive or sensitized skin, including after cosmetic procedures. Water/Aqua, Glycerin, PPG-15 Stearyl Ether, Steareth-2, Stearyl Alcohol, Isopropyl Myristate, Steareth-21, PPG-20 Methyl Glucose Ether, Cetearyl Alcohol, Polydimethylsiloxane, Vaccinium Myrtillus (Bilberry) Fruit Extract, Viola Tricolor (Pansy) Herb Extract, Avena Sativa (Oat) Kernel Extract, Vitis Vinifera (Grape) Fruit Extract, Tocopheryl Acetate, Citric Acid, Sodium Citrate, Ascorbic Acid, Trimethylsiloxysilicate, Mica, Titanium Dioxide, Chlorphenesin, Benzyl Alcohol, Benzoic Acid, Sorbic Acid, Fragrance/Parfum, Hexyl Cinnamal, Alpha Isomethyl Ionone, Citronellol, Limonene, Hydroxycitronellal.